This Participant Packet is the designed for those who would like to join a Consoling the Heart of Jesus Small Group Retreat. 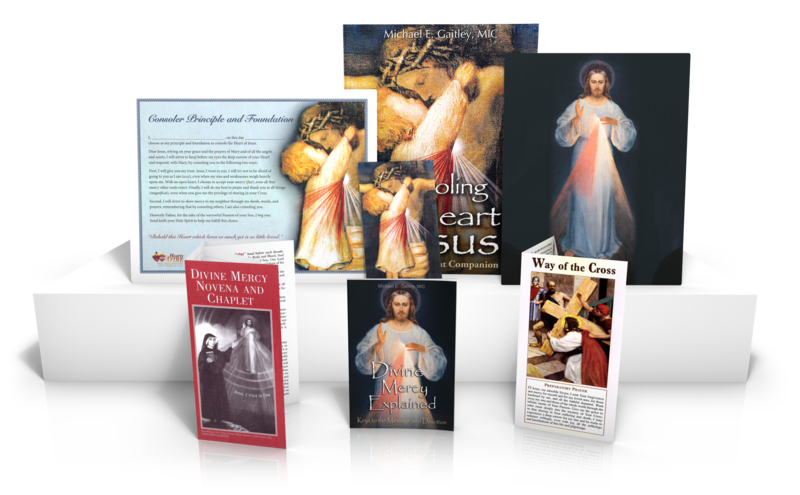 Each item in this packet was thoughtfully chosen as an aid to bring participants deeper into "consoling spirituality" and devotion to the Divine Mercy. Click the image to the left to enlarge and see all kit contents. The actual retreat book, Consoling the Heart of Jesus, is included in this kit. Click here to order additional copies now. 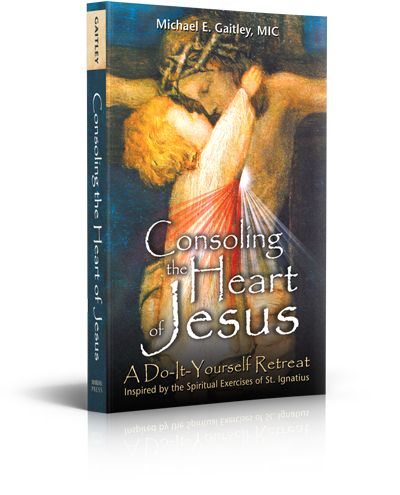 This Participant Packet is designed for those who would like to join a Consoling the Heart of Jesus Small Group Retreat, yet already have the retreat book Consoling the Heart of Jesus. 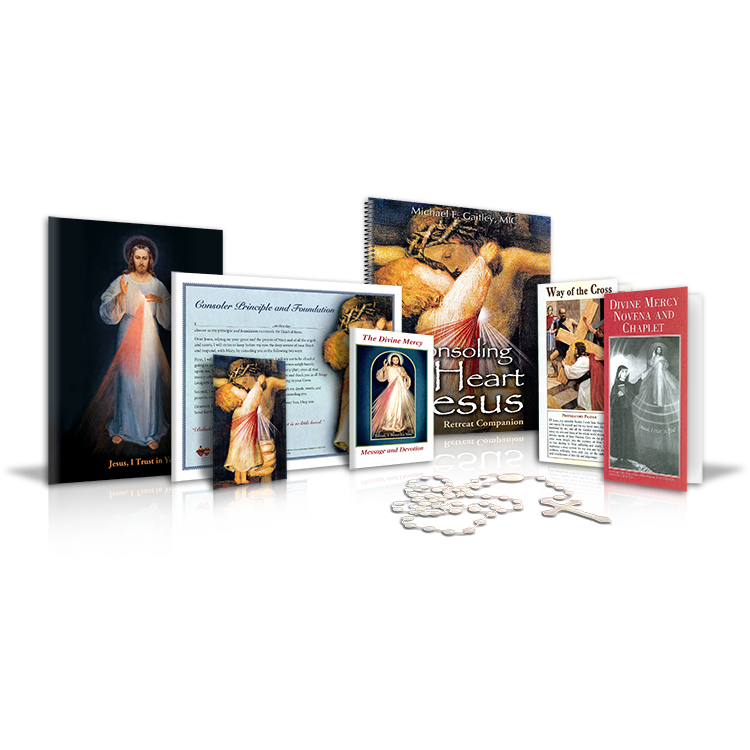 Each item in this packet was thoughtfully chosen as an aid to bring participants deeper into "consoling spirituality" and devotion to the Divine Mercy. Please note: The actual retreat book, Consoling the Heart of Jesus, is not included in this kit. Click here to order it now. Fr. Michael Gaitley, MIC, has given us a very special gift in his thoughtful and prayerful "Do-It-Yourself Retreat." He brings together several spiritual traditions and blends them in the pattern of the Spiritual Exercises of St. Ignatius. We will find inspiration in the quotations from the saints that he gathers carefully and in his deep, but humble, understanding of the principles of holiness that they proclaim. This is a good way for a soul to begin the journey in responding to the call to embrace the Divine Mercy of the Lord. Book Dimensions: 5.56" x 8.44"